Spring is here, which usually means less comfort foods and more crave-worthy salads. 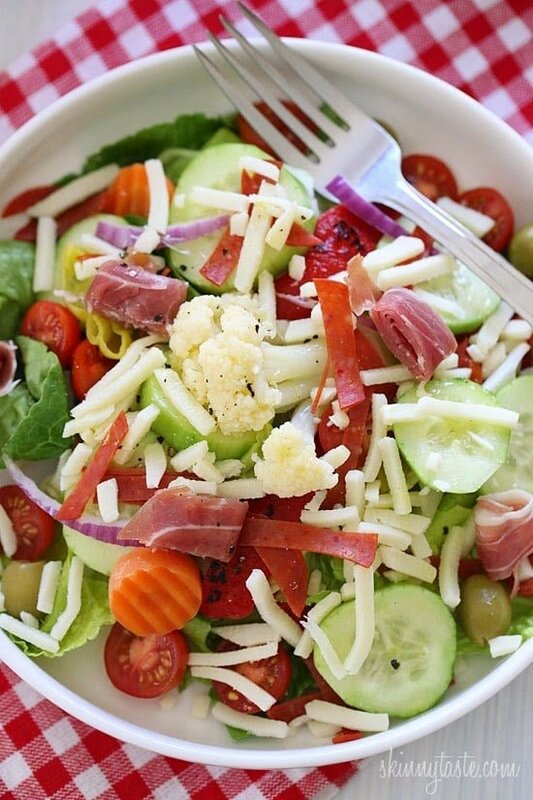 But salads can often have more calories than you think! 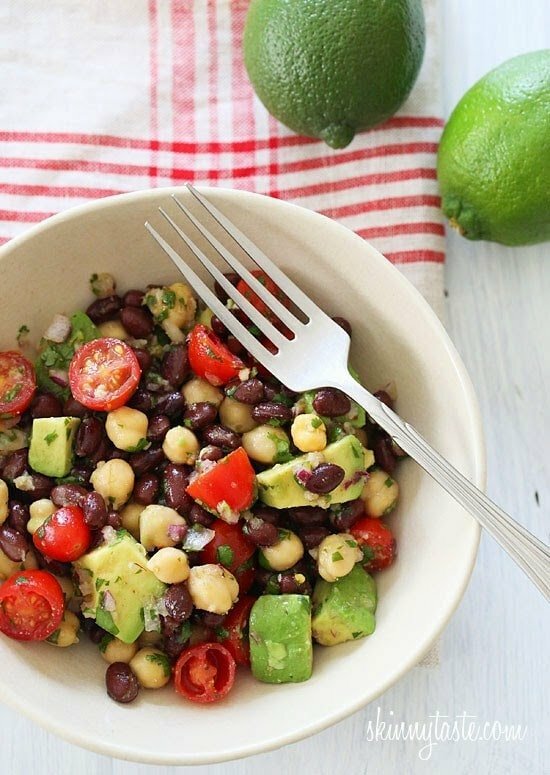 Here is a roundup of my favorite 15 Light and Healthy Salads that are far from boring! 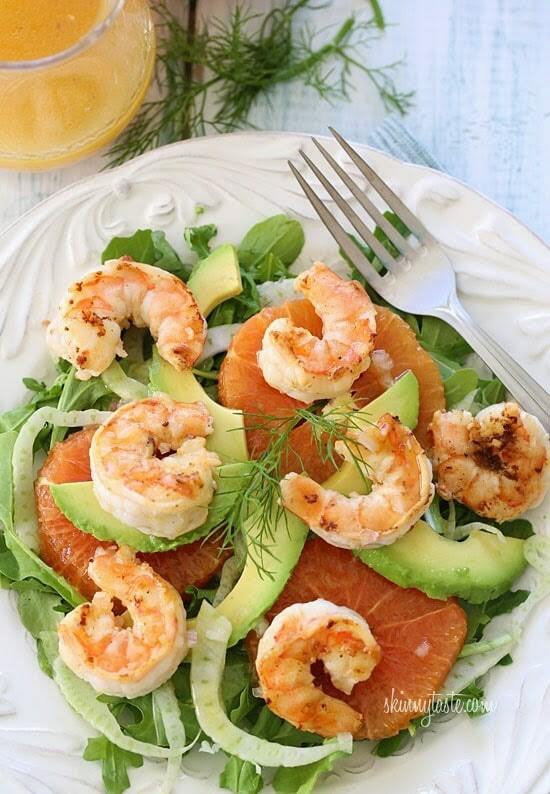 Grilled Shrimp Avocado Fennel and Orange Salad – Grilled shrimp, slices of avocado, shaved fennel and oranges are served over baby kale and mixed greens then topped with a citrus vinaigrette. Sea Scallops Arugula and Beet Salad – This salad is restaurant quality! 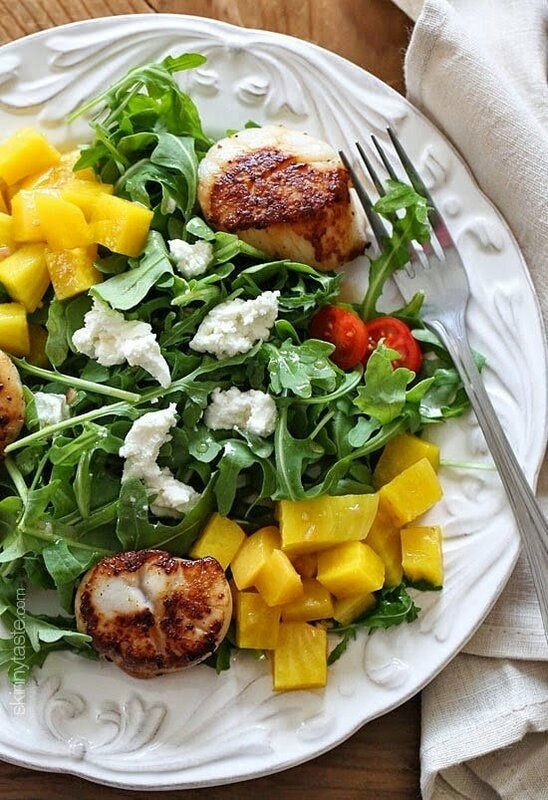 Sweet yellow beets, arugula, goat cheese and sauteed scallops tossed with a honey vinaigrette. Quick and easy! 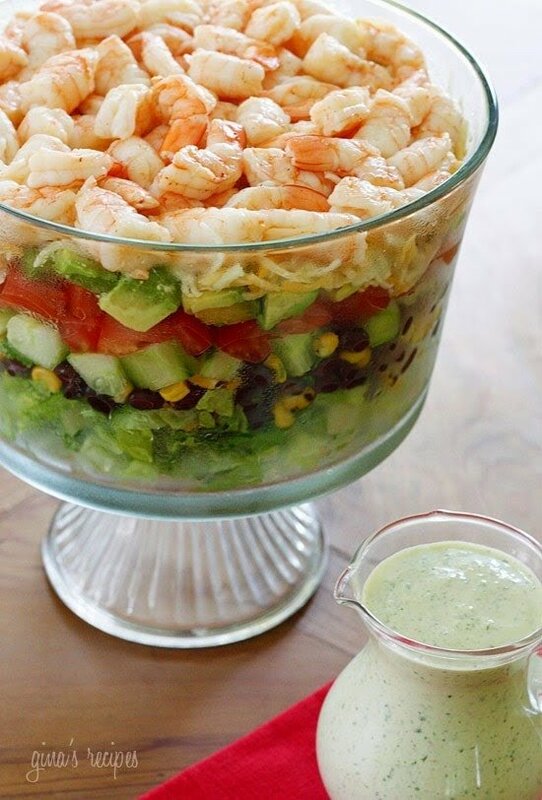 Grilled Shrimp and Watermelon Salad is one of my FAVORITES! 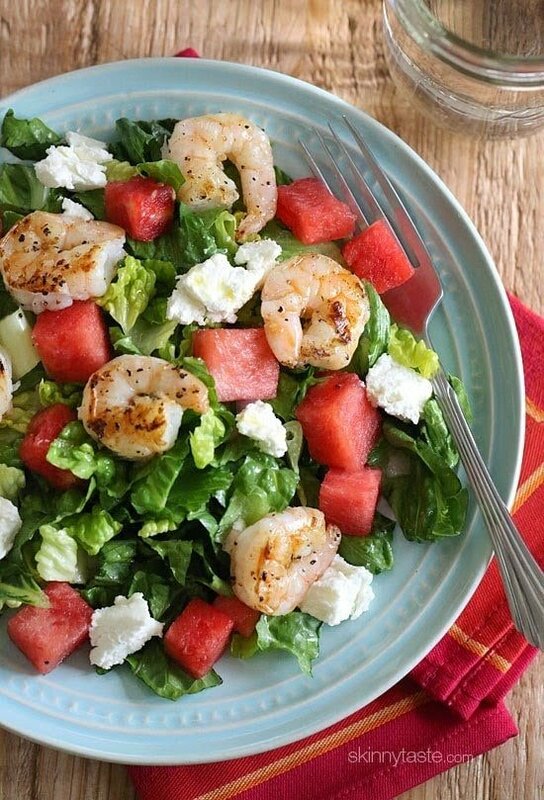 Chopped romaine tossed with sweet, juicy watermelon, grilled shrimp and goat cheese and a golden balsamic vinaigrette. 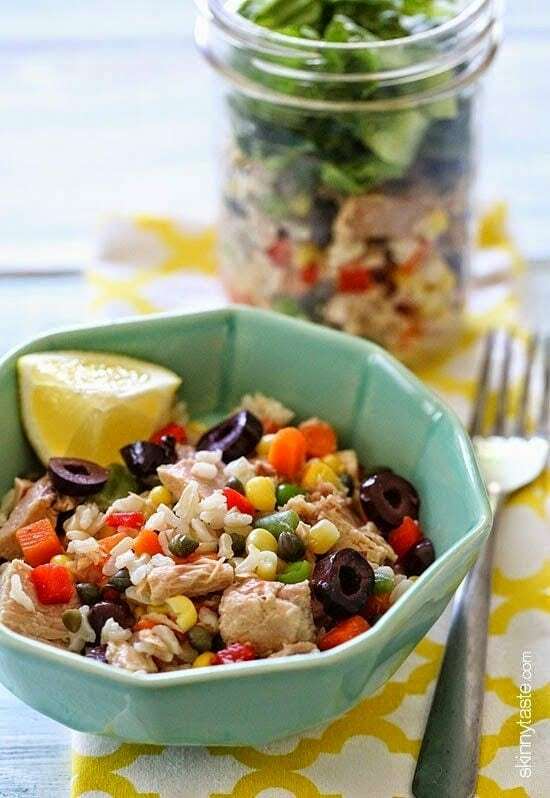 Italian Tuna and Brown Rice Salad is inexpensive and perfect to make ahead for lunch for the week. To make it quicker, I buy frozen brown rice from Trader Joe’s, it’s delish! 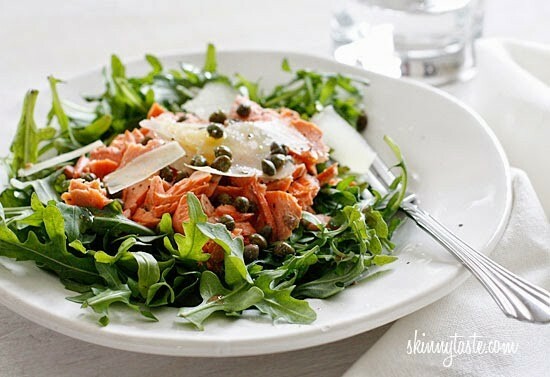 Arugula Salmon Salad with Capers and Shaved Parmesab – My favorite way to use up leftover salmon!! Loaded with healthy fats. 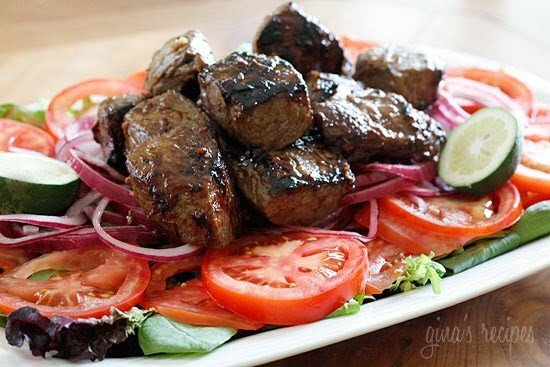 Vietnamese Shaking Beef if beef is what you crave, this delicious salad is for you! 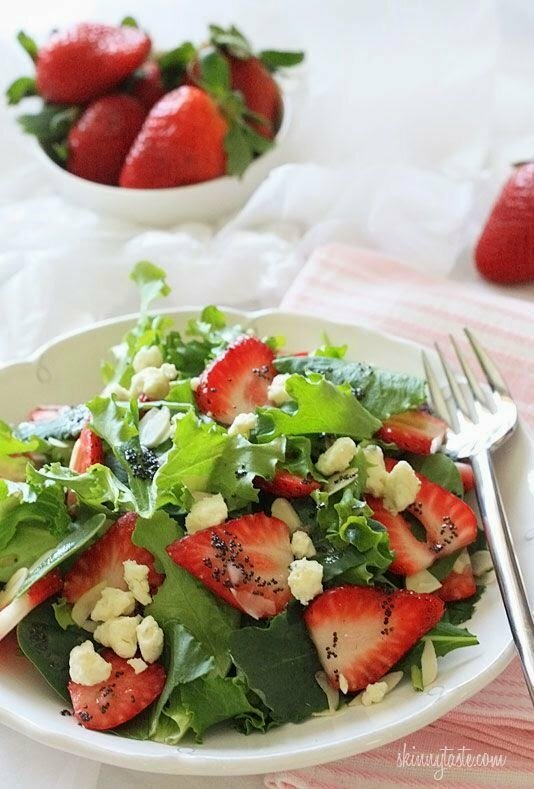 Strawberry and Gorgonzola Salad with Poppy Seed Dressing tossed with slivered almonds, this salad is delicious on it’s own or perfect as a side for grilled chicken or shrimp. 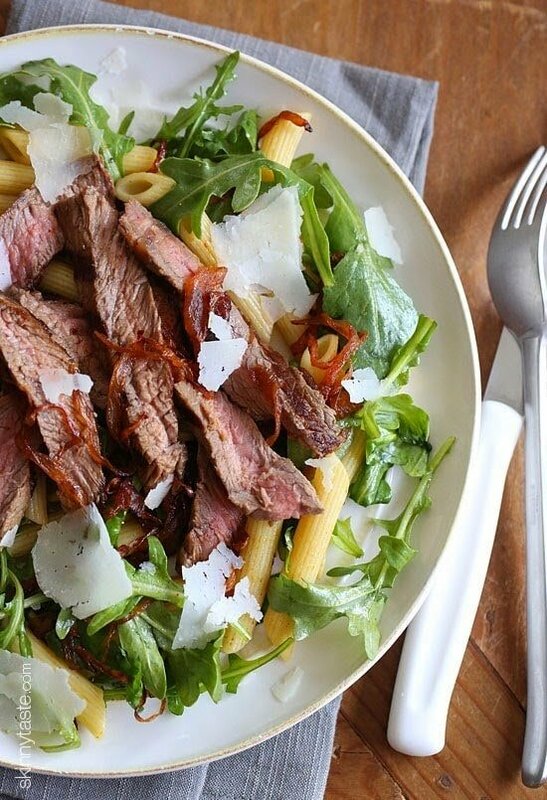 Steak and Caramelized Onions with Arugula and Quinoa Penne – I’m a sucker for a good steak salad, and this one is AWESOME! 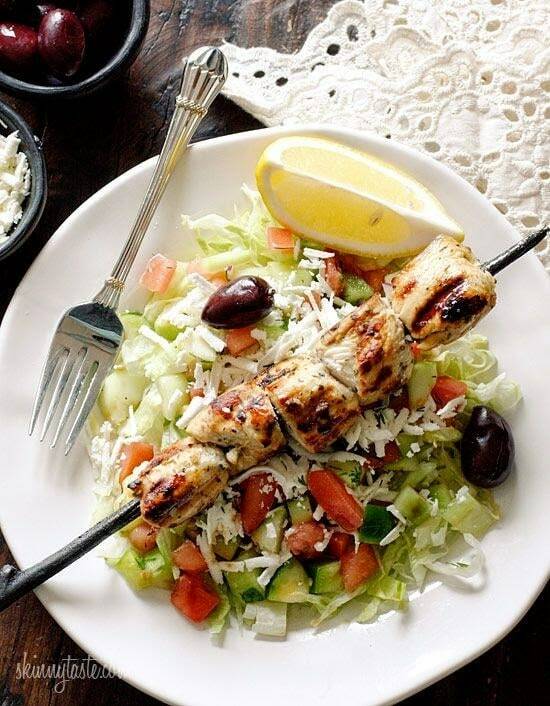 anytime is salad season for me….I like to eat salad for breakfast, lunch and supper…. Love the variety of recipes! Looked at both beef recipes, I liked how you utilized the same cut in two different ways, great versatility! Both look mouthwatering amazing! Thanks! They all look delicious! Yay for salad season! 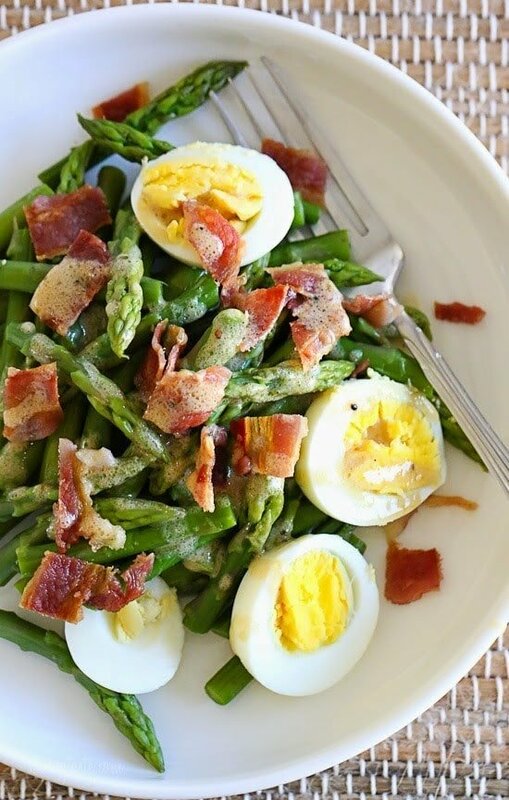 I made the asparagus, egg and bacon salad twice last week. It was delicious!! Thank you for an awesome recipe! You read my mind! I was just thinking today that it was time to start breaking out the main dish salads, thanks! 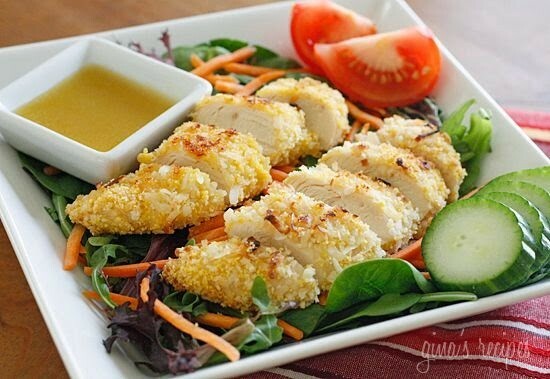 I am feeding my 4 hungry college boys home for Easter the Coconut Chicken salad as a healthy alternative to pizza. Need a side to go with it. Any suggestions? Wow these look good. Thanks for this! My husband and I are doing WW and it's always nice to try out some new dishes for a healthy lunch or dinner. Yum! Thanks Lisa…good luck to you both. This post, and the soups post, are my favorite ones of the year. I am so looking forward to my lunches for the next few weeks, now! Great post! I love your blog and your cookbook! Thanks for a great round up! I love your Vietnamese shaking beef salad! It's an absolute staple! 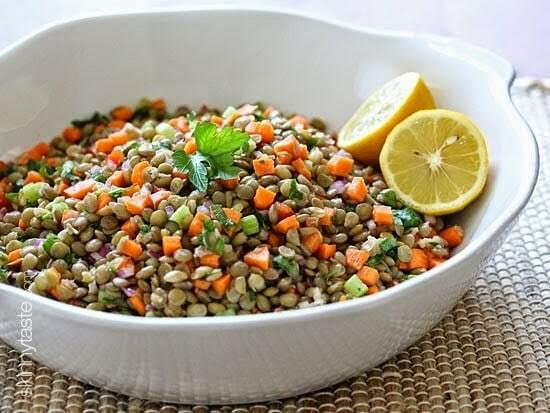 Love the lentil salad, can't beat delicious and healthy!